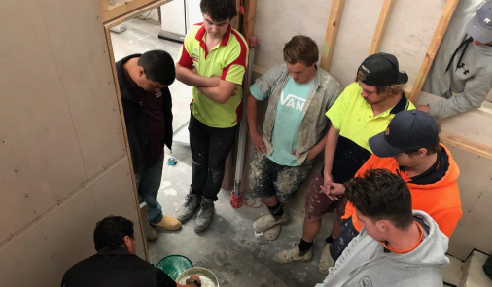 LATICRETE QLD Technical Sales Rep, Mitchell Haw, recently visited the TAFE Queensland SkillsTech in Acacia Ridge to provide students training on waterproofing with HYDRO BAN® waterproofing and crack isolation membrane, and HYDRO BAN® Fillet & Sealant. HYDRO BAN Fillet & Sealant is a one component, fast curing, hybrid elastomeric adhesive and sealant. This product is specifically formulated to meet today's Green Building Standards and has excellent adhesion on a wide variety of substrates. Particularly for use under HYDRO BAN Waterproof Membrane as a transition fillet and crack filler. Want to arrange a demo or seminar customised for you and your team? Visit www.laticrete.com.au.